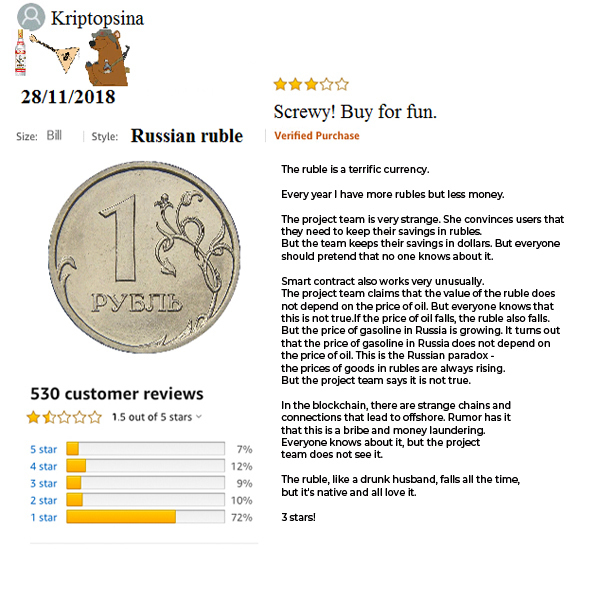 After Black Friday and Cyber Monday emptied everyone’s pockets and filled most companies’ review forms with self-entitled rage, we present our own selection of the best reviews of our favourite product: fiat money. It seems like every year commerce tries to expand their made-up holidays a bit further. Black Friday gave birth to Cyber Monday, and marketers are increasingly pushing towards something called “Cyber Week”, which sounds like robots but is in fact a synonym for "shop till you drop." Now the dust has settled, the shelves are being replenished and most stores are ongoing repairs after the past week’s consumer frenzy. 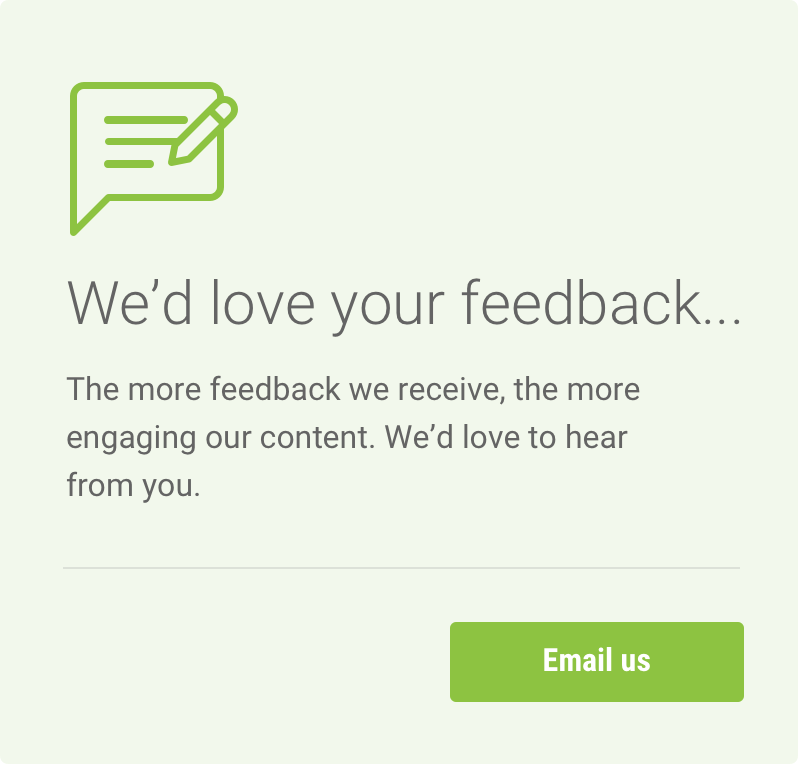 Right now, customer services agents throughout the world are dealing with the ensuing avalanche of angry, threatening reviews that have inevitably flooded their websites - and Cloudbet's very own fiat money review contest has come to an end! For the past week, we have captured some of this celebration’s feelings towards something that we all know and love: fiat money, or the thing most people still call just money. 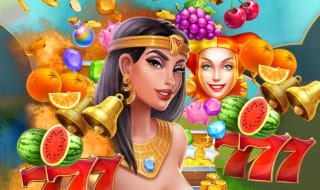 However, the creativity of our reviewers did not stop just there, and our dear participants had predicates to all sorts of money-related things. Banks, loans, currencies, no sacred beast of finance was left untouched. Money, as we found out, tells a lot of stories, and not all of them have a happy ending. It was no easy task selecting the best, as there were so many smart, funny and creative entries, so we’re awarding the top five now, and will announce ten special mentions very soon. Thank you all for participating, and congratulations to all of you. 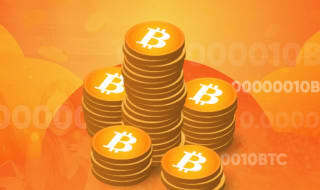 Let’s hope crypto can make a better job of keeping our money safe, valuable and free. So, without further ado, here are the top entries for Cloudbet’s Review Fiat Money Contest. 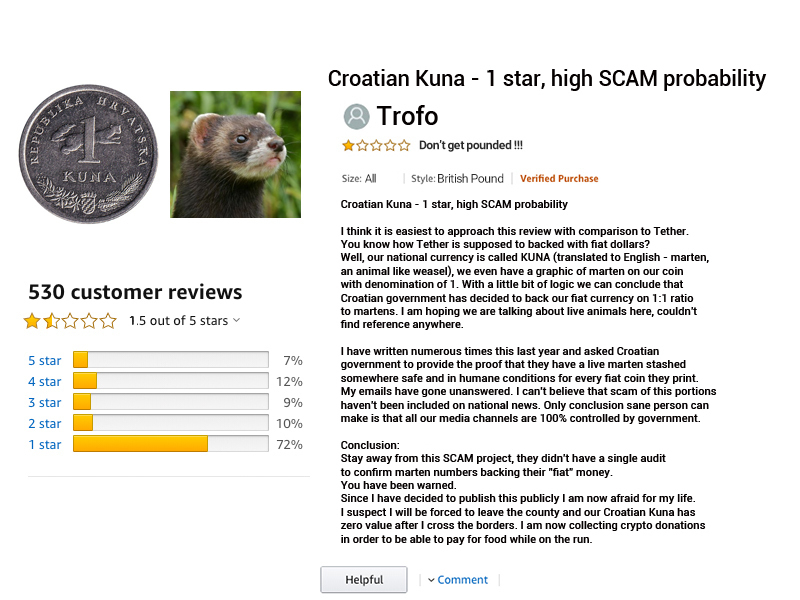 Trofo proves that it’s no use trying to hide bad money behind cuddly animals’ faces. Shame on you, Croatia. 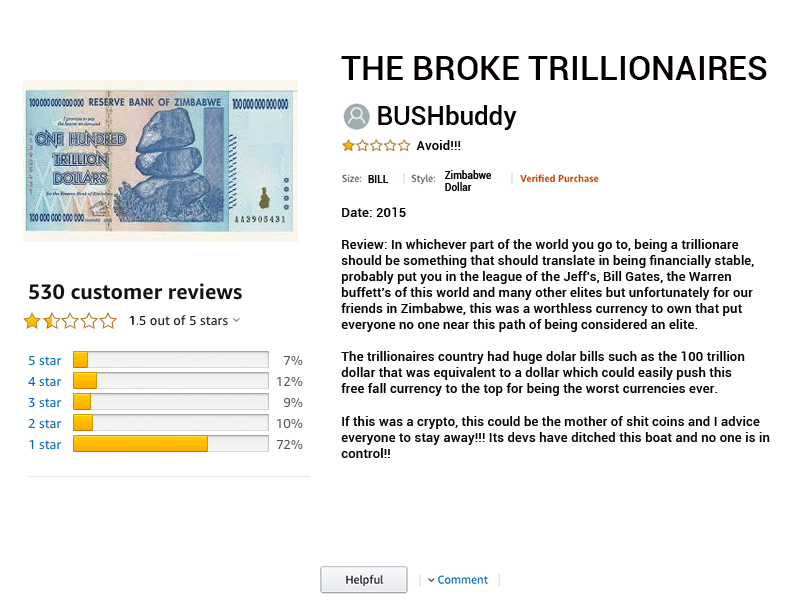 BUSHbuddy exhumed the one deceased currency in our list. 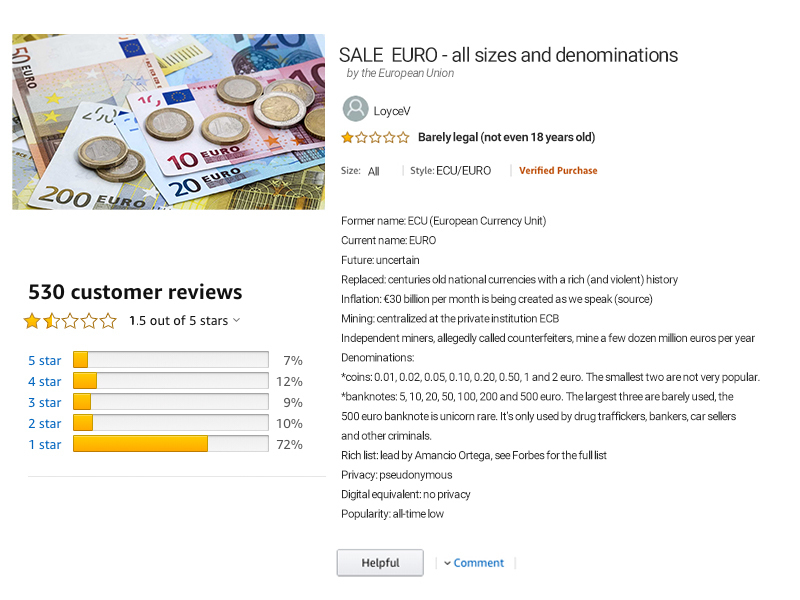 We believe one star is maybe a star too many for a currency that progressed in powers of 10. RIP, Zimbabwean Dollar. 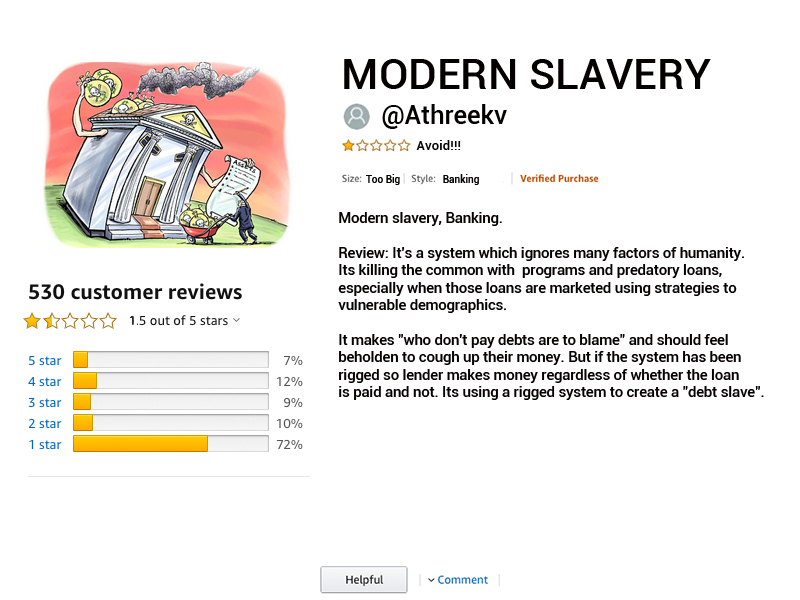 Athreekv puts it out there, and gives it one star for banks. Who’s too big to fail now? LoyceV lashes out a well-researched and detailed breakdown of the Euro - and to think people think Chinese miners are centralising bitcoin, hun? We still have many other special mentions, which we’ll announce in a later article. For now, however, we’ll get on with our raffle. 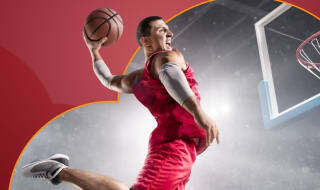 You can check the rules in our contest article. If you got a ticket, now buckle up, cross your fingers and check out the bitcoin blockchain after 10am UTC tomorrow morning - you just might win bitcoin! And if your review wasn’t in our winners’ selection, don’t panic - you can still win a treat as one of our special mentions. Just check out if you are the raffle winner or if you're amongst the special mentions! If you enjoyed this competition from Cloudbet and are looking for more bitcoin prizes, you might also want to check out out some of our other free promotions running at the moment! For soccer fans we have a Super 6 Soccer Predictor competition running on Bitcointalk, with a weekly prize board containing free spins and BTC, and a Nano Ledger Blue available for the overall winner! If you prefer your competitions a little more simple, we also have a free weekly raffle on Bitcointalk, with a Denarium physical bitcoin up for grabs - each one comes pre-loaded with 0.0015 BTC!